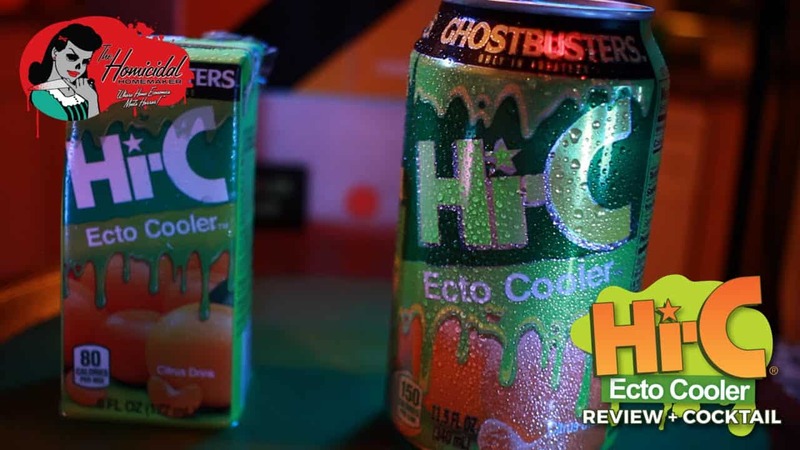 A dream come true – Hi-C Ecto Cooler is returning from it's untimely demise! As a self-proclaimed “retro snack enthusiast”, I’ve always held hope that Ecto Cooler would someday return. I’ve always said: if the 80’s & 90’s had a flavor, it would be Hi-C Ecto Cooler. Now, as a self-proclaimed “retro snack enthusiast”, I’ve always held hope that Ecto Cooler would someday return. I’ve signed petitions, written to the company, and even attempted to recreate the drink myself. 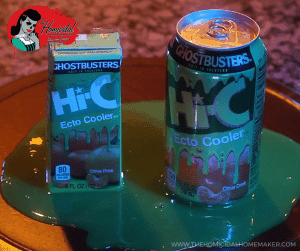 So when I heard that a new “Ghostbusters” movie would be coming out, I’ll be honest – the only thing I wanted to know was if Hi-C would be resurrecting Ecto Cooler from it’s untimely grave. Surely they wouldn’t miss this opportunity…would they?! Now, while Ecto Cooler saw it’s demise in 1997, the formula did stay in production under different names until the early 2000’s. But I’m happy to report that the drink that fueled many sugar rushes for kids of the 1980’s and 1990’s, can now be enjoyed starting on May 30, 2016! Prepare for that rush of childhood nostalgia! I’d like to thank Coca Cola and Hi-C for selecting me as one of the lucky folks that gets to help spread the word about the return of Hi-C Ecto Cooler If only I could describe the overwhelming excitement I felt when this package arrived. They sent me this really awesome promotional ghost trap box that includes two packages of Hi-C Ecto Cooler, and a barrel of ectoplasm! Ecto Cooler will be available in two forms – the squeeze box version, that we all love and remember, and for the first time ever, standard can form. I really, really love the packaging – it sends me right back to being a child, popping open my lunchbox at school, or enjoying a cold glass after school before I started my homework, since Hi-C came in a 46-oz can when I was a child, and trust me, we always had a supply of it on hand. 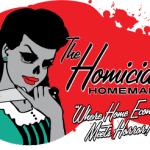 Right off the bat, I noticed that they decided to use an older version of the Hi-C logo (!!! ), and the cans have a really rad feature where the Hi-C logo changes from yellow to a ghoulish green after it has been properly chilled. The boxed version is a tiny bit thinner and taller than compared to the old version, and does not contain an image of Slimer. But it’s what’s inside that count, right?! And guess what? It was EXACTLY how I remembered it! Now, as much as I wanted to be filled with green Ecto Cooler colored greed and keep the delicious beverage all to myself, I was generous enough to share it with my crew. Everyone said that it definitely took them back to their childhood; I was really happy that we all got to experience this together, as cheesy as that sounds. Also, my younger brother, Adam, has literally had to live his entire life hearing me talk about Ecto Cooler without ever trying it. The closest thing he ever tried were my attempts to recreate the drink myself. So it meant a lot to me to see him have his first taste of our beloved ghoulish green concoction. And yes, he did say that it lived up to everything that I said about it. He can’t wait until it hits the shelves, and either can the rest of the crew. It is really exciting that those folks within my age demographic get to relive this staple from our childhoods, while getting to introduce it to the younger generation for the first time in many, many years. For whatever reasons, call it fate…call it luck, call it karma, I believe that everything happens for a reason. I believe that we were destined to get Ecto Cooler back. 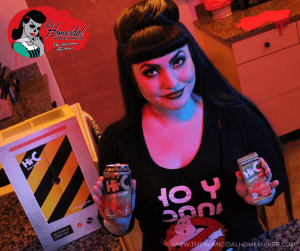 Of course, in true The Homicidal Homemaker fashion, I did want to use Ecto Cooler to make a fun cocktail – check out the recipe for my Ghostbusters “Ecto-1” Cocktail with Stay Puft Marshmallow vodka, below! Chop the marshmallows into small pieces; you want the inside of the marshmallow as exposed as possible, as this will dissolve the easiest. Add the chopped marshmallows to your mason jar, and top with plain vodka. Set in the refrigerator, and allow to soak for 24 hours. Shake the jar every 6 hours or so, to help them dissolve. If the mixture seems too thick or syrupy, you may add more vodka, if desired. After 24 hours, give it a taste – if you’d like more marshmallow-flavor, add more marshmallows and allow them to soak a little longer. When ready to serve, use a fine mesh strainer to remove any undissolved bits of marshmallow, and you’re ready to use it! In a glass with ice, combine 1 shot of Stay Puft Marshmallow vodka with equal parts Ecto Cooler and Club Soda, or to taste preference. The Club Soda is optional, but it cuts down on the sweetness and adds a bit of fizz to the drink. Previous articleCelebrate Friday the 13th with a Jason Voorhees Camp Crystal Cake!